Angry Birds, a popular multi-platform game needs no introduction. Angry BirdsÂ Â is one of the most popular game in current market and is available for PC, Mac, Android, iOS, Web Version (via Google Chrome app) and Facebook version of Angry birds. The game has been successful till now and their latest installation “Angry Birds: Space” has been successful as well and sold million copies with-in-a few weeks of release. In this post, we will guide you how you can download Angry Birds Space for PC (demo) free & for Mac OS X/ iOS/ iPhone /iPad / Android devices from market place. The game comes with 60 levels, and additional contents can be purchased through in-app purchases (currently in the iOS only). The game contains hidden goodies and secret levels, and Rovio will be providing regular free updates in the future. The game play of Angry birds is bit different than previous version and features new birds with new abilities and features. 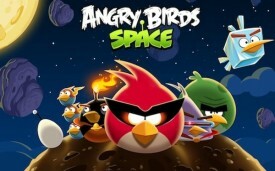 Angry Birds Space feels some what familiar to previous released but fresh because of gravity-oriented physics. It also contains mini-game inside a game, once that mini-game ends you’re transported back to where you left off in the original level. There is also a new power-up which replaces the Mighty Eagle of previous game. Space Eagles can be triggered any time which batter through a wormhole to squash anything in their path. You can get the iPhone version here. The iPad version from here, and the Android version from Google Play. The Mac version is available in the Mac App Store. Price ranges from 0.99$ to 6$ according your device. The Free version can be downloaded from below. Angry Birds for facebook released : Play it Now!